I walked through the Arab market of the Old City of Jerusalem. It was not very crowded in the early morning; some vendors setting up their shops and displaying their merchandise, some religious Jews coming or going to pray at the Western Wall, a few tourists. Knowing the painful history of this place, I am always on guard. Jerusalem, the subject of prayers and psalms, is the heart of the Jewish nation, and yet, this tiny area has never known peace. I know Jews have been stabbed to death over here. As much as the place looks peaceful, nothing more than a shopping bazaar, I know the calm is an illusion. This ancient city has passed hands many times and has been fought over for centuries. I am very aware. I listen to what the people are saying and I try to understand, "Sabach al chir yah Machmud" (Good morning Mahmud), one man says to another, "Sabach a nur" (A morning of light to you!). Just merchants and customers greeting each other. The fragrance of the food and spices fill the air as does the calming Arabic music. I keep my eyes open as I walk briskly. Who might be a problem? Most are just ordinary merchants and residents going about their daily business but one must be aware. Too many people have been attacked here, too many innocent walks through the market ended up as violent encounters. You can never relax, you must always be aware and always profile. An elderly shop owner is less likely to attack you with a knife, a young man walking about with no packages or merchandise – more likely. You must keep your eyes wide open to all sides, not get distracted by conversation, keep your hands where they can react most quickly, work out scenarios in your mind. You must profile, that is part of Krav Maga. A couple of tourists from Norway, walking hand in hand? unlikely to be terrorists. A young Arab man walking alone, getting too close to you – keep an eye on him, and keep a safe distance, as much as possible. You must always be aware of your surroundings. This is not a racist approach, this is sensible behavior based on past experiences. He who wishes to survive must learn from the past. Krav Maga is not just about fighting, it is about awareness; it is about analyzing people and their behavior. It is about being ready. So train hard, be aware of your surroundings, profile, learn what to look for and stay alert. 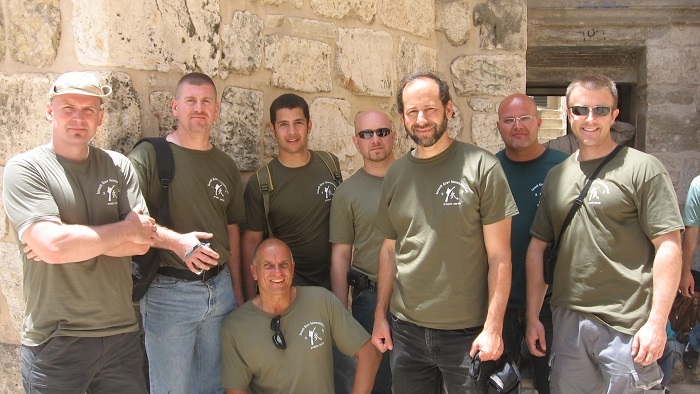 The first Tour and Train group ever, taking a break in Jerusalem.